There have been a lot of books that have been indispensable to the way I approach life and/or design, mostly revolving around the themes of post-humanism, ecology, and emancipatory politics. 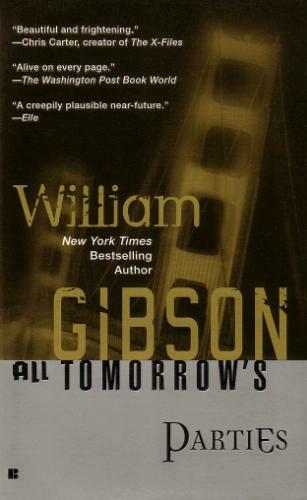 But the one I return to, time and again, is All Tomorrow’s Parties, a science fiction novel by William Gibson. I’ve got to admit, I hesitated somewhat at choosing this book. I guess I felt I should choose something ‘smarter.’ As I browsed through the books that have been so influential to the way I understand the world, I came up with several that could be ‘The’ book. Haraway’s Simians, Cyborgs and Women was a major contender, so were Guattari’s Three Ecologies, and Wark’s Hacker Manifesto, books by Merleau-Ponty, Judith Butler as well. Another Literary possibility was Doctorow’s Makers, into which I fell comfortably, already well acquainted with that subculture. But I chose All Tomorrow’s Parties because the final book in Gibson’s Bridge trilogy shows him at his most convincing as a designer. For Gibson, the act of design is of weaving a narrative from disparate strands, not as an object, more an emergent process that is not bounded inside any territory, but multiplies in many directions and across many borders. Nowhere is this more explicit than the community Gibson creates on San Francisco’s Bay Bridge. It’s a community that some might be tempted to read as dystopian, but nothing is further from the truth. The power of the community is both in Gibson’s eye for the artifact, the material character and history embodied in the object, but also in the polyvalent community that allows and makes space for disparate narratives to emerge. Gibson’s presented a picture of a parallel economy and community that only tangentally participates in established economies governed by nation states or corporate groups, where these illusory power structures are not only shown to be not only impotent, but also unnecessary. Because I’ve been ‘mid-move’ for the past 5 years, my obscene collection of books is packed in boxes and dispersed between my partner’s, brother’s and mother’s houses, which meant I couldn’t spend too much time with the collection. This was probably a boon, as otherwise, I could see myself still trying to choose. I think there could be some future posts on literary inspirations for the future of design, I’d like to unpack Gibson a little more, and also Cory Doctorow.